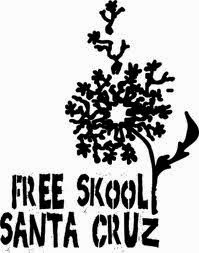 Free Skool Santa Cruz: Beginnings and Endings and New Beginnings. The five of us are gathered outside, just past dusk and before the moon rise. One person hands us old Free Skool calendars from a flat cardboard box. Each of us has a small stack. Each of us holds up the calendars we are naming, and we see the distantly familiar header and display of class names, before we ball up the paper and place it in the center of the dark fire ring. And so we invite you to SubRosa, Friday December 5th at 5pm, for a Farewell to Free Skool Santa Cruz Celebration, as we let go of this current version of the project. All 30 calendars from the project's 9+ years will be hung on the walls and this will be an opportunity to connect with each other and remember what was, and perhaps to imagine what could still be.